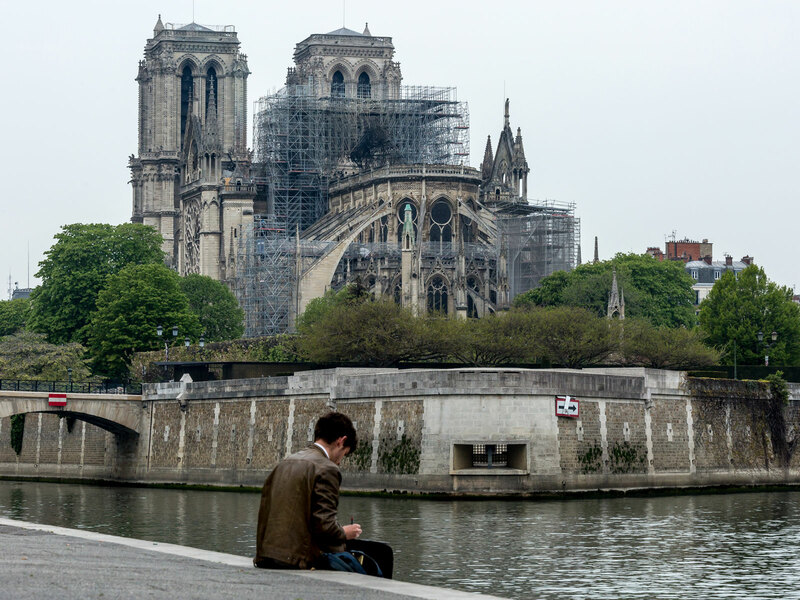 The news agency Agence France-Presse (AFP) reports that two French billionaires, Francois Pinault and “crosstown rival” Bernard Arnault, have pledged to donate 100 million euros ($124 million) and 200 million euros ($248 million) respectively to help rebuild the iconic cathedral. A man draws the damage caused to Notre Dame Cathedral on April 16, 2019 in Paris, France. Pinault is the chairman of Kering, the international luxury retail giant behind names like Gucci and Yves Saint Laurent, and his holding company Groupe Artemis owns a half dozen wineries including Bordeux’s Chateau Latour, Napa Valley’s Eisele Vineyard, and Burgundy’s Clos de Tart. For the record, Groupe Artemis’s own website boasts that the entity’s “consolidated assets exceed 30 billion euros,” so a few repairs on an old church shouldn’t set Pinault and company back too much. LVMH’s boozy interests include 27 different producers in the wine and spirits category, which beyond the brands mentioned in its name also features Chateau d’Yquem, Dom Perignon, Veuve Clicquot, Ardbeg, Chateau Cheval Blanc, Glenmorangie, Krug, Cloudy Bay, Belvedere, and Terrazas de los Andes — just to name a few. Meanwhile, proving there’s more to life than money, the Charlois group, which owns a number of cooperages producing barrels for the industry, has pledged to make wood available for any repairs. “The work will surely take years, decades even, but it will require thousands of cubic meters of wood,” Sylvain Charlois said according to the AFP. “We'll have to find the best specimens, with large diameters.” Who says alcohol can’t solve your problems?